Almost two months ago, I had not had a new pair of glasses in over six years, and the one pair I had left were suddenly lost in a tragic accident involving my purse, a set of apartment keys, and my own flailing fist. I promptly made an appointment with the optometrist to update my prescription. Luckily, I had an old pair of disposable lenses kicking around for just such an occasion, and they managed to carry me through until a few weeks later, when I was finally able to buy my new glasses. I picked them up on Friday after work. Did you notice those italics? Them. I no longer have to fear my own flailing fists so much, because I found an optical dispenser that had two-for-one glasses and that didn't jack up the price on the first pair. Having an extra pair on hand is important for me, because I only have about five inches of clear vision at best. If I don't have a back-up pair when one set breaks, I am left scrounging for over $500 that I never seem to have on hand, and I can't work until they're replaced. Hell, I can't even safely take a bus without my glasses. Or get to the bus. Or find appropriate attire to leave the house in. 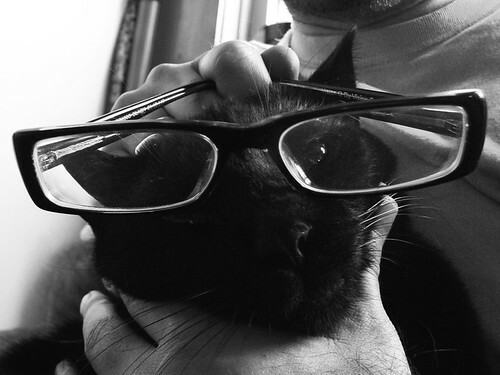 One time a few years ago, I couldn't find my glasses before work. I had to call in sick and spent the better part of the day crawling around the apartment on my hands and knees, systematically feeling along surfaces in order of height from highest to lowest. At several points, I sat on the floor feeling dejected and vulnerable, and then I found some pot under the couch and developed a sense of humour about the situation. My roommate returned home from classes mid-afternoon, laughed out loud at me, and handed me my glasses. They were on top of the VCR. That happened to me no less than three times in my early twenties, and let me tell you, that sort of thing never makes you feel any smarter. The first pair of frames I picked out a couple of weeks ago are thick and black and plastic, because I have always wanted frames like that. My paternal grandfather always wore that style of frames when I was little. His had whisps of dusky light streaks through the black that matched his beard. Mine, though, are just black. 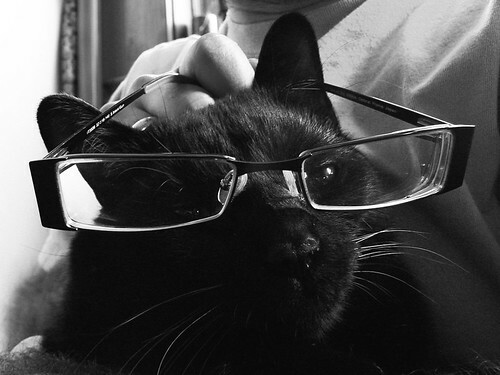 Oskar is modelling my new glasses for you. He agrees with the importance of protecting my anonymity and leapt at the chance to ape for the camera. You can see below that he is excellent at aping a cat that is very pissy. (Ignore what appears to be the Fiery One's hand around Oskar's neck. That is an optical illusion. I swear). The second pair I picked out because I have a thing for art deco and all the cat's eye glasses made my eyebrows look like they were trying to fly away with my face. Oskar chose his best impression of a cat resigned to his fate for this photograph. (I think he's just sucking up with the hope that this will become a paying gig for him. Sooner or later he is going to have to accept that cat food is the top of the pay scale around these parts for cats with no prior employment experience). I believe that I am polyamorously in love with my two new pairs of glasses. Not only are they funky and practical, but I have also been headache free since Friday night. Until Friday night, I estimate (conservatively) that I had a headache to some degree at least 95% of the time over the last year. It seems insane that I would live with that, but I did, and I found all kinds of excuses for the headaches aside from my need for new glasses simply because of the expense. I can't see and I have headaches, I would think. It must be my allergies/a brain tumor/dust in the air/that finger I have jambed up my nose. If you didn't know that I was ridiculous before, now you do. I and my new pairs of glasses have decided to save up for an elopement. I would like to take a trip to sunny Argentina, but they have their screws set on a whirlwind tour of frames factories in southeast Asia. I suppose this is the first of many difficult decisions we'll have to face as we chart the course of an unconventional three-way marriage. And not to worry, the Fiery One had given us his blessing. Suddenly, I want to start a new collection. I haven't collected anything in a while, and I will need your help for this one. I want to collect pictures of people and things with eyeglasses on. Send me a photograph of yourself with your glasses on either you or something else, depending on your deal with privacy. Stick your glasses on a fire hydrant if you want to. If you have more than one pair of glasses, feel free to send me more than one photo. I will make a small photocollage entry of people and things in glasses with links to the entrants' sites if they're made available. Remember to include your url in your e-mail, so that your picture can act as a link to your site. - The glasses featured must be ones that you either wear now or once wore. - If the glasses pictured are on an actual, living face, it must be your own face. If you do not want to use your own face, then please use an inanimate object. - You must consent to my resizing the picture down to a thumbnail square, because I will. It will be fabulous to see what you all wear. E-mail your pictures to me at: schmutzie at gmail dot com. Now, I showed you mine. Will you show me yours?